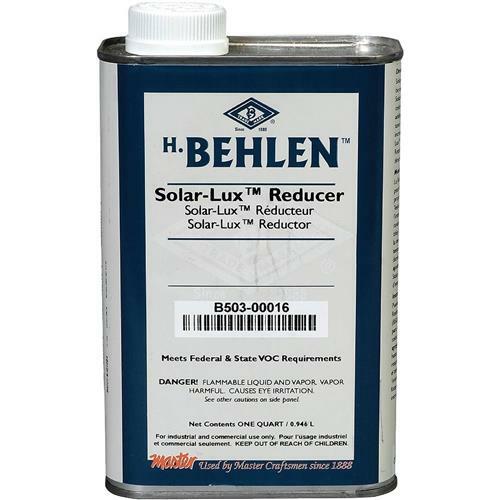 Behlen B503-00016 - Solar-Lux Reducer, 1 qt. Solar-Lux is a highly fade and UV resistant, non-grain raising dye based stain. The deep penetration brings out the wood's natural beauty. Solar-Lux stains may be intermixed to achieve customized shades. It dries in approximately 1 hour and accepts a finish coat of varnish, polyurethane, oil or conventional lacquer. 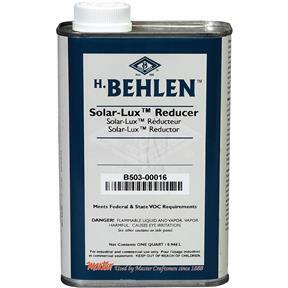 Solar-Lux added to Behlen lacquers produces a superior tone that deepens colors without clouding or painting the finish.